One of the many reasons I wanted to go to Ikea was to try their famous Swedish meatballs. And just like the awesome store, the food did not disappoint. Thankfully, I do not need to drive two and a half hours to the nearest Ikea store every time I have a craving for these because this homemade version is very close to the real deal. The meat is flavorful and sauce is creamy and meaty in flavor. And the allspice? Well, that's the ingredient that just keeps you wondering. It gives the meatballs a distinct but mild unique flavor. My husband and I cooked this together while the little one napped and it made me nostalgic for our pre-bebe days. Barely any space in our littlest kitchen but drunk on newlywed bliss. In a large sauce pan, heat oil on medium heat. Add onions and garlic; sauté until onions are translucent and soft, about 4-5 minutes. Add celery and parsley; cook for about 3-4 more minutes. Let cool for a few minutes. In a large bowl, combine beef, egg, onion mixture, breadcrumbs, allspice, salt and pepper. Mix well and form meatballs about 1/8 cup each. Add beef stock to the large sauce pan and bring to boil. Reduce heat to medium-low and slowly drop meatballs in the broth. Cover and cook until done, about 20 minutes. Remove the meatballs with a slotted spoon and set aside. Add cream cheese and blend the sauce with a hand blender until smooth. Simmer for a few minutes to thicken. Pour over meatballs. Garnish with parsley and serve with your favorite noodles. 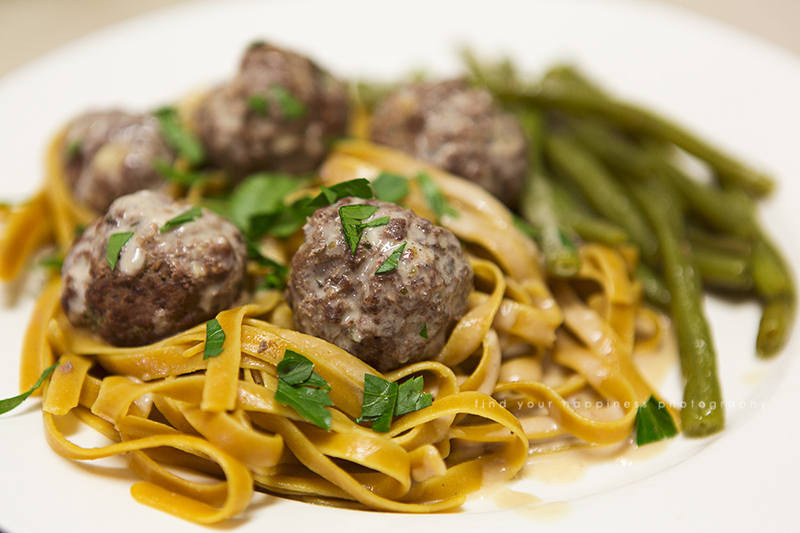 The meatballs look delicious, but the noodles also really caught my eye. Are they a common brand that one could find in the supermarket? I had some trouble with cooking the meatballs in only 2 cups of broth ... I had to use more than twice that much in order to have enough liquid for them all. But I still used 2 cups for the sauce, and then it was too thin so I added some cornstarch slurried with sherry, and then it was just right. The meatballs themselves were verrrrrrry tasty, despite my lack of meatball skills, so thanks for the recipe! I made these tonight! Wow it came out great! I baked them for 20 minutes on 350, then added them to sauce! To the broth I added sauteed mushrooms and garlic! Thanks!! My meatballs didn't come out round like yours, is there a certain way you're supposed to roll them?